Stand up Straight for better Posture! I’m sure you’ve all had someone say to you “Stand up straight!” My friends mother would make her stand against the wall for 5 minutes whenever she was caught slouching! It’s so easy to just relax and slouch down to a little ball. Especially if you sit for long periods of time at a computer or stand while you preform tasks. Now more than ever, we are staring down at some kind of device! My posture has become horrible! I don’t even realize I’m not standing up straight until I catch myself in the mirror or in a photo. My back, neck and shoulders really feel the effects after a long week. I thought I need to have help reminding myself to stand up straight! After I read so many articles about posture, it seems that good posture not only looks better but it’s better for your overall health. Good posture improves your breathing, your lungs have more room to expand to so you get more oxygen. More oxygen leads to a better memory, better learning and improved mood. This power stance help some overcome anxiety. The other benefit is that you look taller, slimmer and younger! Win, Win, Win! Proper posture keeps your bones and joints in correct alignment so muscles and ligaments are used properly. Bad posture can wear out joints quickly and causes lots of pain in your neck and back. Your spine can also become fixed in an abnormal position. I didn’t want to wear an uncomfortable brace so luckily I found the LUMO Lift from Body Tech. 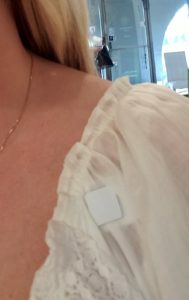 http://www.lumobodytech.com/ It’s a little device that you attach to your clothes below your collarbone. It’s magnetic so it doesn’t put holes in your clothes. They give you a black and silver button to match most clothes. You can purchase additional buttons in different colors and one even looks like a ruby. It gives a little vibration when you are not in the correct position. It’s connected to an app you download on your phone. When I started to order the device, the total was $99 but when you go to checkout it’s $79! It stays charged for about 5 days. The app is great at keeping track of your progress. 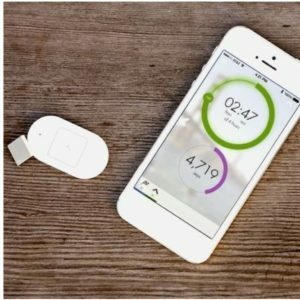 The LUMO Lift also counts your steps and calories burned for the day too! I’ve been using it for a couple weeks now and I am doing better even when I forget to wear it! Here are some self tanning secrets! We all are a little nervous showing our white arms and legs this time of year! It would be nice to have a little color right away. It just makes your skin look better, you don’t notice all the little veins. A client once told me that tan fat is better than white fat! 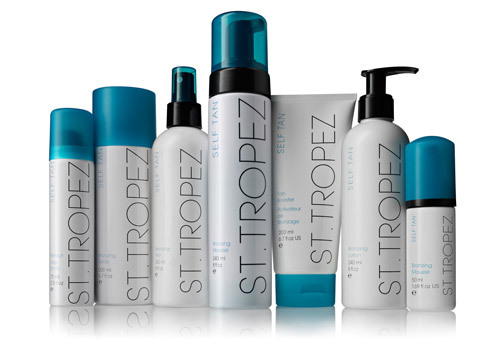 Hahaha This is St. Tropez Tanning Products and everyone seems to love them. It’s tempting to dive right in and use a self tanner. They can be tricky but if you have a few tips for the application process you will be so much better off. It’s best to EXFOLIATE your skin first. Dry skin usually is in patches and can tan darker than smoother skin. It’s best to use a loofah or scrub all over your body first to get your skin as smooth as possible. It’s best to have MOISTURIZED skin as well. If your skin is moisturized it will be smoother and will take the color more evenly. Use a great moisturizer all over your skin before applying the tanning product. Continue to use a moisturizer after your tan to get more days out of your color. It’s best to apply the tanner in SECTIONS and really RUB it in. Rub until you think you’re done and rub it in some more. Be careful around your knees, ankles and elbows, these areas are always dryer and take color a lot faster. Some say to add a little moisturizer to the tanning lotions when applying to these parts of your body. Always make sure you WASH YOUR HANDS frequently in between sections of your body. In between your fingers can get pretty dark really fast. Use gloves if you have them. Apply tanner on your hands last. And rub, rub, rub. It’s best to let the tanner dry really well. If you can forego clothing for a while it’s always best. Some directions say 20 minutes but an hour is really best. Each self tanner is different so follow their directions. Some will say to wash after applying and some say don’t. Most of the time you layer the tan on, so you can get darker with every application. Avoid using scrubs after applying your tanner. That will take off layers of color and your tan will fade quicker. Always remember to use sunscreen when out in the sun. Even though you appear to have color you do not have any barrier for the suns rays. Dry Brushing is the Best Way to Exfoliate! Dry, scaly skin is not on anyone’s list for the holidays! Exfoliating at least 3-5 times a week can get rid of dry skin and improve it’s texture. Exfoliating is so important to get rid of all dry dead skin cells that look flaky and dull and that are covering the new skin cells. Getting rid of the dry skin will promote healthier smoother looking skin. Exfoliating the skin on your face is a tricky thing. Daily exfoliating is helpful but you need to be very gentle. Just using a wash cloth with your cleanser can be enough. Some like a facial brush and the Clarisonic brush is very popular. Using a finely grained scrub will do the trick. As for the skin on your body there are lots of choices. A wash cloth and body scrub used regularly do the trick. It’s really important to be consistent with scrubbing your body. You won’t see a lot of benefits unless you’re dedicated to a good schedule. A loofah sponge is amazing. A loofah in the shower is great but the benefits are many when used on your dry skin before you get in the shower! This is called “dry brushing”. Dry Brushing is the best way to exfoliate! You start at your feet and work your way up to your heart. You do the top half of your body and arms all coming toward your heart. This removes dead skin cells and helps to stimulate blood circulation. My friend is sure that her skin is smoother and the cellulite on her legs has diminished. Once in the shower, a light scrub will get all the extra dead skin off and leave you silky smooth. I have noticed a big improvement in my skin but I’m not very consistent. I remember too late when I’m already in the shower. Always use a hydrating lotion on your face and body after exfoliating. Once your skin is clean from bad cells your skin care products will perform better and you will be silky smooth! Bust out the sunscreen, it’s summer! You just finished shopping in an air conditioned store. You are walking out the automatic doors and get blasted with the warm air of summer. Ahhhh summers warmth wrapping around you better than any blanket made. Summer in the Burgh means hot days and if you are not careful about protecting your skin while outside it can also mean sunburn or even worse, skin cancer. Are you using sunscreen correctly? We will help you navigate through the sunscreen tips and tricks. So pour your self a cold drink, throw on a sunhat and bust out the sunscreen and we can start to learn some helpful tips! Lets kick it off and dive into the details of the basics. -The higher the SPF ( sun protection factor) the better. Always choose one where the SPF is 30 or higher. -You want your sunscreen to be waterproof. Although water proof you will still need to re apply after sweating heavily or getting wet. -Be sure that the sunscreen provides broad-spectrum coverage. You want it to protect you from UVA (long wave ultraviolet A) and UVB ( short wave ultraviolet B). Both are responsible for causing skin cancer. UVA penetrates deep in to the skins layers where UVB typically burns the upper most layer of skin. Regardless of what they penetrate you want to be sure to halt their journey on your skin. –Apply 15 min before heading out. It takes your skin a few minutes to absorb so be sure to give it some time. -Make sure you are using enough sunscreen. That amount that should be used to cover an adults body will fit in the palm of your hand. Also be sure to rub it in completely. -Hit all areas on your body. This includes face, ears, tops of feet, lips and scalp. A good sunscreen for the face is Neutrogena Ultra Sheer Body Mist Sunscreen Broad Spectrum Broad Spectrum SPF 100. Brooke swears by this product. She takes it everywhere with her. It’s light weight and does not clog pores which is a really great feature for the face. Brooke used it in the Bahamas and didn’t burn at all so it gets our thumbs up! For the lips a chapstick that has an SPF of at least 15 will do. The scalp needs attention as well. You can wear a hat to protect your scalp which also has the added benefit of protecting your face from the suns rays or you can buy a sunscreen specifically for your scalp. Great Sunscreen for Body and Scalp! The scalp formulated products are generally less greasy and can also add moisture to your hair while protecting it. Once again with the SPF, make sure its 30 or higher. A product we have used for scalp protection is Banana Boat Quik Dry Sport Body & Scalp Broad Spectrum SPF 30. This is a win win because it can be used for your body and scalp! – Reapply every two hours. You want to reapply immediately after getting wet or sweating heavily. Even though it says waterproof it needs to be re-slathered for maximum protection. -Last but not least, toss the expired sunscreen. Using them past their prime is basically like not using it at all. The components can break down making it no longer helpful against the suns harmful rays. Luckily it’s not expensive so buying a new bottle is no biggie. We have covered a lot of ground. There is a ton of information out there to help you get the most protection. It’s always a good idea to keep up on new information regarding sunscreen and the requirements to be protected properly. For some more information visit the Skin Cancer Foundation’s website with the link provided. Now go have some fun in the sun with your new best pal this summer, sunscreen! This is “Not Really A Waitress”. It was one of the shades from the Fall/Winter Hollywood Collection 1999. 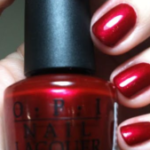 It is OPI’s number one most popular color of all time! We love getting each new collection in the salon and can’t wait to read their names. 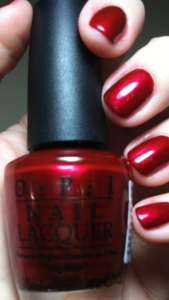 A special OPI team sits in a conference room for 6-8 hours to come up with special names for the collection. They start with a region or city and brainstorm over maps, pictures and even eating the area’s authentic food. My favorite nail color is “Florida Flamingo” which was discontinued years ago. 🙁 If you have a favorite color and would like to use it on your walls at home, Ace Hardware carries Clark + Kensington paint colors in the most popular OPI colors! What’s your favorite color?